REMNANT NEWSPAPER: Why Are We Traditional Catholics? Why Are We Traditional Catholics? (www.RemnantNewspaper.com Posted 3/22/10) Editor, The Remnant: Thank you for your article "SOS: Millions of Catholics Overboard" by Samuel Frankel, Esq (1/31/10 issue of The Remnant) I could just imagine countless readers of The Remnant, thinking with a very sad sigh: "Yes, that is exactly the way it is in my family." In response to my own frustration, I prepared a statement for my grown children who were raised in the post-Vatican II church, having been born in the mid-1960's. After floundering in the Novus Ordo churches for many years, my husband and I discovered, by the grace of God, the Catholic Faith was alive and well in a neighborhood SSPX Chapel. By this time, our adult children were suffering from poor catechetics, diluted doctrines, pabulum sermons and undemanding Catholicism. Totally ignorant of the pre-Vatican II church, our return to "Tradition" was confusing and bewildering for them. Where do you begin to explain the relief and joy we felt to recapture the faith of our youth? It would take hours of discussion with their undivided attention (no small task!). In desperation, I prepared the attached "document", which may be helpful to your readers. This statement has spurred our children to ask many questions and has opened their eyes to the many abuses they are witnessing in the local parish. It is our hope and prayer that this spark of inquisitiveness will eventually help them find their home– the Traditional Catholic faith. Thank you for your consideration. As your parents we have a responsibility and duty to transmit to you the truth of our Traditional Catholic beliefs. We are not a “new” religion in conflict with the Catholic faith. We belong to a relatively small group of faithful whose purpose is to worship according to ancient liturgies and preserve for future generations the immemorial Tridentine Mass. Because you were raised in the shadow of Vatican II, a Council called by Pope John XXIII and continued by Pope Paul VI, which ended in 1965, some of the words we have already used are not familiar to you. It is our hope and prayer that after reading this, you will have at least a brief outline of the events that led to the Catholic Church as you know it and will plant a seed for future exploration. THE NEW ORDER MASS: WHERE DID IT COME FROM? When Pope John XXIII called the Second Vatican Council in l960, almost every bishop in the world was puzzled. Vatican Councils historically are only called when the Church is in some desperate need or is fighting a very serious heresy (a widespread attack on a dogma of faith, i.e., Mary was not the Mother of God). But this was a time when the Catholic Church seemed to be in her glory. We had an abundance of priests and nuns. Seminaries were full. Catholic schools were overflowing. It was not uncommon that attendance at Mass on Sundays and Holy Days of Obligation was standing room only. Almost every Saturday, there were lines for Confession. If you read the documents of Vatican II (most Catholics have not), there is nothing in them to justify the numerous changes made in the Holy Sacrifice of the Mass. It did not forbid the Mass to be celebrated in Latin. It did not call for the removal of altars to be replaced by tables. It did not call for the removal of Communion rails where the congregation KNELT to receive Holy Communion. It did not allow Eucharistic Ministers or altar girls. It did not allow Communion received in the hand. It did not allow most of the changes made to our liturgical ceremonies and devotions. Unsuspecting priests and pastors, who may never have had an opportunity to read the documents, merely followed orders from bishops who knowingly or unknowingly were puppets of liberal, modern bishops at the helm. All of this did not happen overnight. The changes were subtle. If you put a frog in boiling water, it will jump out. If you put a frog in cool water and slowly raise the temperature, it will boil to death. Some older priests who would not accept the changes, left or retired. Conservative, orthodox nuns left the convent. The new modern ones gladly shed their habits and bought suits, making them undistinguishable from the rest of society. Most people, confused by it all, did not question the changes. Holy Mother Church would not deceive us or lead us astray. Some just followed in obedience, but many lost the faith. Was the Catholic Church before Vatican II perfect? No, she is made up of people, and people make mistakes. Even priests and nuns are not immune to sin. But the church was our moral compass and there was no moral issue in the world that was not firmly addressed from the pulpit. Our churches were built to inspire awe and devotion. Every parish had weekly Novenas and Benediction with great attendance. A woman would not dare walk into a church without a head covering and a modest dress—never pants. Men wore dress shirts—never T-shirts or shorts. “So you worship, so you will believe. So you believe, so you will worship.” The way we worship reflects our belief. Receiving Holy Communion without being in the State of Grace means it is not that important to you. Going to church dressed like you are going to the beach also means there is nothing all that special going on. When anyone could administer or touch the Sacred Host, the belief in the Real Presence is weakened, and in many cases, lost. When the Novus Ordo Mass became the rule, the faith of the people started to die. Does this mean that everyone who attends the Novus Ordo Mass is not holy? Does this mean that every Novus Ordo clergy is sinful and disbelieving? ABSOLUTELY NOT! What it does mean is that these very special people who have maintained their sanctity and treasure their faith deserve the true worship in the Traditional Latin Mass. The Traditional Latin Mass is that rite of Mass through which the Roman Catholic Church has worshipped God for centuries, offering to God the Father the sacrifice of Jesus at Calvary for the redemption of mankind. Ancient church documents show that this rite was precisely offered word-for-word by the Popes and clergy even before 600 AD. Tradition tells us that this rite was used substantially unchanged for centuries before that time. In 1570, Pope St. Pius V in a document called “Quo Primum” proclaimed that this was the Mass to be celebrated for all time, even to eternity. He warned that changing the Mass would destroy the Church and the faith of the people. He very clearly stated that anyone, including a Pope, who would alter the Holy Sacrifice of the Mass would be putting his own salvation in severe jeopardy and would “incur the wrath of the Holy Apostles Peter and Paul”. Starting with his Papacy, every Bishop had to take a solemn oath against “modernism” (changing the Faith to conform to the times). Why Latin? Before Vatican II, no matter where you traveled, when you entered a Catholic Church you knew the Mass celebrated there was exactly the same throughout the world. Latin is a dead language. It is not used in conversation. Therefore, words are never taken away, added, or meanings changed. For example, the word “gay” used to mean happy. Today it has a totally different meaning. Words cannot change like this in a “dead” language. Faithful Catholics followed the Mass with their missals written in their own language. Those who did not use a missal still felt part of the celebration, standing, kneeling or sitting with the congregation and sensing the sacrality of the Holy Liturgy. A French priest who knew no English could offer Mass on Long Island without the parishioners knowing he could not speak their language. In contrast, when we attended New Order Masses in our travels today, we never knew what the priest was going to do or how he was going to do it. Many masses we attended seemed very foreign, irreverent and sometimes strange. Novelty is the rule of the day. Unity is gone. Each Bishop became his own authority in his own diocese and priests in his parish experimenting as they willed. The Traditional Latin Mass CANNOT be forbidden by any Pope and it has NEVER been forbidden. On July 7, 2007, Pope Benedict XVI issued a motu proprio “Summorum Pontificum” “liberating” the Traditional Latin Mass and stating with authority as Vicar of Christ on earth that this Mass never was and never can be abrogated. Most Bishops have tried to ignore this decree, but many priests, thankfully, are now rediscovering the beauty of the Tridentine Mass. By the grace of God, one of the Bishops who was an active participant in the Second Vatican Council became horrified when he realized that once the New Order Mass could come into common use, the Faith would die. His name is Marcel Lefebvre. He was ordained a priest in l929 and served as a Missionary in Africa. He became aware of the direction the liberal Bishops were taking the Church. In l970, with the approval of the Vatican, he founded the Society of St. Pius X and, with a handful of dedicated priests, vowed to preserve for us, our children and our grandchildren the “Mass of All Time”. In spite of much persecution from within the Church, he held fast and would not surrender his belief that the Latin Mass must forever be preserved for the salvation of all mankind. Knowing he would not live forever, he begged Pope John Paul II to give him a date when he could consecrate four of his priests as Bishops, so that they, in turn, could ordain priests. The act of ordination was never forbidden, but it became more and more clear to Archbishop Lefebvre that forces in the Vatican were determined to destroy the Society by leaving them with no Bishop after his death. After being denied a specific date time again and being left with no choice, Lefebvre ordained four bishops without the expressed mandate from the Pope. In spite of this Archbishop Lefebvre and the four bishops were never formally excommunicated. This act was to preserve the faith, not destroy it. It has never been disputed, even in Rome, that the priests of the Society of St. Pius X are validly ordained and that the Sacraments are validly administered. The Society is not fully united with Rome but the case for Tradition is being presented to the Holy Father at this moment by Bishop Fellay, Superior General of the Society of St. Pius X. The Catholic Church did not begin with Vatican II and no one on earth has the right to condemn or destroy everything before it. The Society of St. Pius X acknowledges Our Holy Father as head of the Catholic Church. Prayers are said for him at every Mass. The Catholic Church has always spoken of the Mass as a “Sacrifice” It is an INFALLIBLE TEACHING (without error) that Christ left a visible Sacrament to His Church in which the sacrifice of Calvary is re-presented for all eternity in an unbloody manner. The Novus Ordo Mass is presented as the “Lord’s Supper”, a banquet meal shared by the community. This is why the Altar of Sacrifice has been changed to a table. While the Last Supper is definitely part of the Liturgy, it cannot be separated from the Cross and Calvary. I know this is very difficult to understand. Suffice it to say, that when the MEANING of the Mass was distorted, many errors and abuses crept into the Church. What are the fruits of Vatican II? The Council Fathers predicted a “new springtime” for the Church. Here we are more than 40 years later and the Catholic Church is in the “dead of winter”. Priests and nuns abandoned their vocations by the tens of thousands. Seminarians decreased by 90% (1965-2002). Teaching sisters decreased 93%. In l958, 74% of Catholics in the USA attended Mass regularly. In 2002, the number dropped to 17%. Catholic churches and schools are closing rapidly throughout the United States, while Traditional churches, schools and seminaries are expanding. A survey of New Order Catholics revealed that more than 80% no longer believe in the Real Presence of Christ in the Holy Eucharist. In order to fill empty seminaries, men with homosexual tendencies (and some active homosexuals) were allowed into the priesthood (previously FORBIDDEN). This resulted in many thousands of scarred victims who are still suffering today. Bishops turned their heads and now the Church is billions of dollars in debt, resulting in the selling of more church properties. Beautiful marble altars were wrecked and discarded in landfills or tossed into rivers. Crucifixes were replaced by ugly, meaningless banners. The Tabernacle where the Consecrated Sacred Hosts were kept at the center of the Altar were moved to the side or totally hidden away. Beautiful statues of Our Lord, Our Blessed Mother and the saints were banished in dark, dusty basements. Stained glass windows depicting the life of Our Lord, Our Blessed Mother and the Saints have been replaced with color geometric designs, depicting absolutely nothing. By canon law, the vessels used during Mass are to be made of precious metal (silver, gold). Totally disregarding this directive, cheap pottery and glass are used, with everyone and anyone handling them. I remember when the church choir, accompanied by the organist, brought tears to my eyes as they sang “Sanctus, Sanctus, Sanctus.” Leave the guitars and drums at home! I could go on and on, but you have the picture. Holiness and sanctity are rapidly fading away! That is why it just isn’t important any more. That is why most Catholics who receive Holy Communion have not been to confession in years and it just doesn’t matter. Sin is not an issue. No one likes using that word – especially many, many priests in the pulpit. Our friends, our children, our Catholic people are being fed stones where once they were given bread. We have re-discovered a treasure we thought was lost. Unfortunately, you never knew the treasure existed. This is why you may find it so difficult to understand why we feel so blessed to have St. Michael the Archangel Church in our neighborhood. If we did not educate you, we would be at great fault. What you do with this information is up to you. We hope and pray that this has given you food for thought. If you have any questions or wish further discussion, we would be happy to provide you with any additional information. Otherwise, there is no more to be said. You cannot hand down what you do not have. We have found it again and wish now to hand it down to you, our children, according to our sacred duty before God as Catholic parents. Excellent and heartfelt article. I pray for the success of the Rosary Crusade and that the heart of the Holy Father, Pope Benedict XVI, will be moved to respond to Our Holy Mother's request; The consecration of Russia to Her Immaculate Heart. Holy Mother please help us! I just finished reading the article "Why We are Traditional Catholics" (One Mother's Open Letter to Her Grown Children). are unable to understand my devotion to the traditional faith. The article brings to mind much of what happened in those days and sadness in me as I recall how I went along with many others thinking this is the way it is supposed to be. Somewhere in my heart, I knew something was terribly wrong. I thank my Dear Lord Jesus and His Blessed Mother for leading me to a Society of Saint Pius X church. Immediately, upon walking into the church to attend mass that Saturday morning I knew I had, at long last, found my True Faith and would Never, Never go to a Novus Ordo mass again. 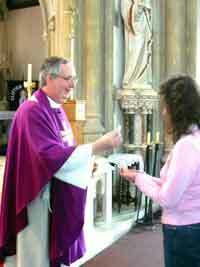 I eventually became a Third Order person in the Society of Saint Pius X.
I love the Mass. It saddens me to leave church when the Mass is over but I will be back for the next Mass! As long as I am alive! I thank God for the gift of being able to attend a True Mass and being able to hear the True Faith preached in the weekly sermons, and being able to be attend benediction, processions and all the wonderful and glorious traditions of the Traditional Catholic Faith that I cherish each and every moment. God Bless Archbishop Marcel Lefebvre for holding fast and keeping the True Faith. His perseverance and love of God has given us the gift of attaining Heaven! Thank you Connie Bagnoli, I will pass this article on to my children with my prayers for them and you and your family for speaking the truth so well. The "Why We Are Traditional Catholics" is a great article. We are fortunate to have an Archbishop in Omaha who has been very welcoming towards Catholic Tradition. In Omaha our Immaculate Conception Parish is exclusively Traditional Latin Mass. My wife and I are blessed to have six children who all have a strong Catholic Faith. I am sending the article along to them. Thank you. A "fruit of Vatican II" that is omitted is the liberation of tens of thousands from their marriage vows through diocesan tribunals that declare marriages null for reasons that are not official. The Holy Father has made this clear every year when he speaks to the Rota in January and emphasizes a particular abuse. Yet I do not hear traditional Catholics complaining about divorce and remarriage as long as there is a declaration of nullity. They should not be trusting the diocesan tribunals any more than they do not trust bishops, priests, or laity who are in charge of parishes. The article could have been written by us! As an Eastern Orthodox Christian it is easy to see that the SSPX and other Latin Mass movements represent authentic Catholicism. Traditional Catholicism has much in common with the liturgical piety of the Orthodox. But I am confused by the following admission:" The Society is not fully united with Rome..."
Does the Vatican I dogmatic text allow one to be in the Roman Catholic Church yet not be directly under Rome??? Can one be "in the Church" yet not in direct subordination and continuing obedience to the Roman See? If the answer is No, then why are the SSPX constantly praised among Traditional Catholics if they are not directly subordinate to Rome? As an Orthodox, I am constantly told by traditional Catholic friends that I need to "submit to Rome and to the Roman Pontiff," but then the same people will praise the SSPX, so I am really a bit confused by all this. That's "united" with a small "u". The SSPX has never questioned the Church's infallible teaching on the theology of the papacy. The SSPX fully recognizes Pope Benedict as the legitimate successor of St. Peter and Vicar of Christ on Earth, and, in fact, prays for him by name in the canon of every Mass offered by a SSPX priest throughout the world. The SSPX has prudential disagreements with Holy Father in much the same way St. Catherine of Siena disagreed with Pope Gregory XI but always recognized his authority as visible head of the Church on earth. There's a vast difference between that and the Orthodox who deny the theological underpinning of the papacy itself. Why Are We Traditional Catholics? is a modern example of inspired writing. Please do not allow it to gather dust in your archives. It says it all and it says it well. It is worthy of a repeat performance on frequent occasions. I believe it is one of the reasons that God inspired the creation of the RemnantNewspaper. Yes, an excellent article indeed. I am working to make it more apt and appropriate to send to my own apostate former wife and four apostate daughters and my seven pagan grandchildren. Any suggestions anyone? A flawless article, one very much worth sharing when inquiring minds ask why we do what we do. Thank you! I couldn't have said it better.